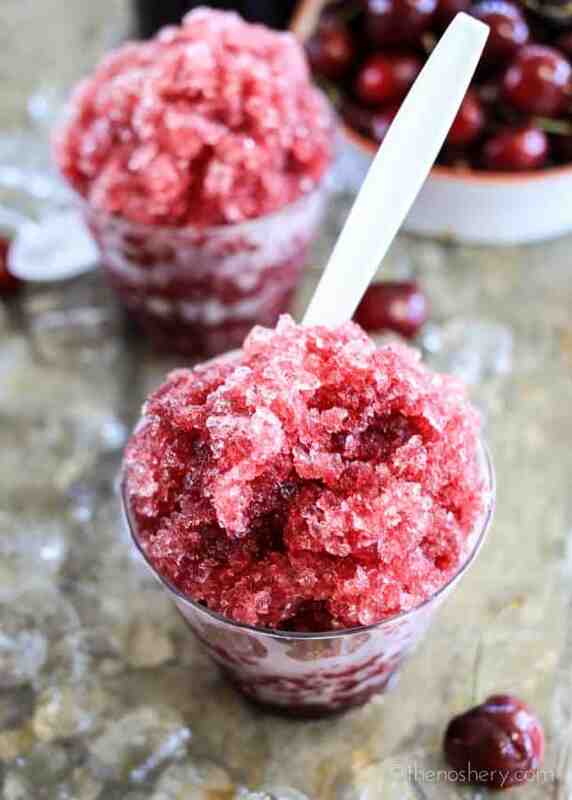 There is no flavor more classic when it comes to shaved ice then cherry. I’m not sure what it is about cherry that kids seem to love so much. It could be the sweetness but, I think they get a kick out of seeing their tongue turn bright red. How many times do your remember sticking your tongue out at your friend and asking if it’s red? Clearly, you can’t go an entire summer without enjoying a cup of cherry shaved ice. I can’t seem to find a shaved ice place nearby so I decided to make my own. But, I didn’t want to do your typical bright red maraschino cherry flavor. Instead, I thought to do a black cherry and vanilla a classic combination that makes me think of summer and pie. I love this syrup because it made with real cherries so, it tastes sweet and fresh not like candy cherry syrup. But, it still turns your tongue red, a dark red, but red non-the-less. If cherry flavored shaved ice isn’t your thing I got a great Creamy Shaved Ice that you are going to love. What would be even more awesome would be shaved ice with vanilla cherry and cream. The perfect combo for those who can’t decide if they want their shaved ice fruity or creamy. How are you staying cool this summer? Do you have any other flavors of shaved ice that you would like to see? I am looking for ideas so I will take suggestions. Have fun this summer and stay cool. The holiday season is officially here! Get my new ebook with a collection of 14 traditional Puerto Rican Christmas recipes to help you get your holiday party season going. I got all the essentials! From pernil to tembleque and the ultimate Christmas drink coquito! In a pot combined cherries, sugar and water. Cut the vanilla bean in half and scrape out the caviar with the back of a knife. Add caviar and vanilla been skin to pot. Bring cherries to a boil and boil for 10 minutes. Remove vanilla bean skin and transfer cherry mixture to a blender. Blend until smooth. 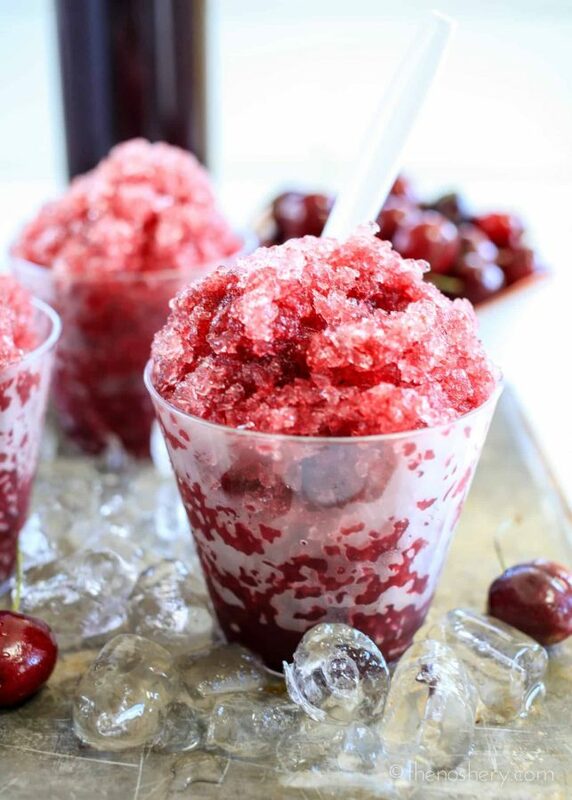 Refrigerate cherry syrup until chilled. 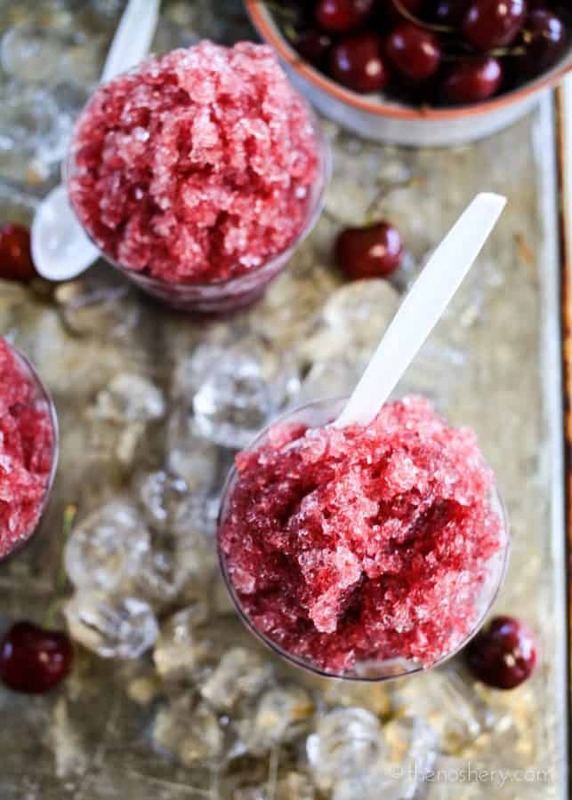 Divide ice between 4 cups, saturate each with cherry syrup and serve. The syrup can be thick for the ice. If you find this to be an issue just toss the ice with the syrup and spoon flavored ice into cups. Meseidy, I am going to make this but with fresh cherries and vanilla extract do you have any suggestions by any chance? Nope, fresh cherries and vanilla extract should work just fine. I do find vanilla bean to have a stronger vanilla flavor but extract works too. Enjoy! Love this version with natural ingredients, trying it sooner rather than later. It reminds me of back home, enjoying a piragua while looking at the sea. Kudos! Love your work ??? This is amazing! I love black cherry flavored ice, but I hate that it is not “real” it’s just a bunch of flavor and sugar. I want to try this real fruit version so I can feel good about indulging in my favorite summer treat again!